This is the same trailhead for hiking the trails through Upper North Fork Matilija Canyon and Murietta. From the trailhead stay on the road past the houses and the turnoffs for Upper North Fork Matilija and Murietta. At about the 1 mile mark the road will turn sharply left and begin to climb out of the canyon, you’ll want to instead continue straight ahead through the Blue Heron Ranch unless you want to end up at Jameson Reservoir. Stick to the road going through the ranch and respect that it is private property so that future hikers can also enjoy this trail. At about the 2 mile mark the road ends and transitions into a trail. It is also at this point that one begins hearing running water, the creek being dry up to this point. Shortly thereafter the trail branches. The less noticeable trail to the left is the remnants of the Bald Hills Trail which at one time led out of the canyon. Stay to the right, essentially following the creek, and very soon you’ll come across the first of two bivouacked camps–both near fairly good swimholes. After the second of these two homemade camps one discovers a variety of hiking trails all mixed together. My recommendation is to stay with the ones along the creek bed as they are ultimately easier to follow and more interesting to look at. 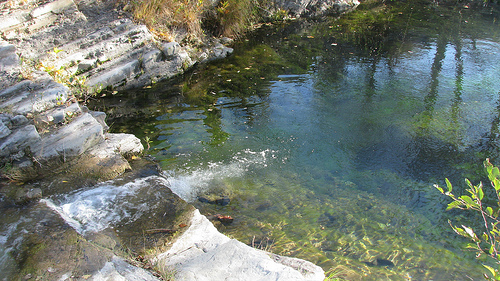 Eventually you’ll arrive at a place where the creek flows over a series of sandstone layers creating a number of fine pools (about 3 miles in.) This time of year the water is definitely cold. From here continue along the intermittent trail and where possible stay to the right side of the creek. You’ll know you’re going in the right direction by the number of homemade camps along the way. I kept half expecting to see bearded prospectors or weary eyed homesteaders around each corner given the nearly half dozen fire rings, pots and skillets I saw along the creek. About a mile and half later you’ll see a small side canyon on the left, please avail yourself of a quick detour as West Falls is well worth a visit. It was at this point I began to realize that it might’ve been wiser to have gotten an early start because there was now a need for some serious power hiking if I was going to get to the falls and back before sunset. 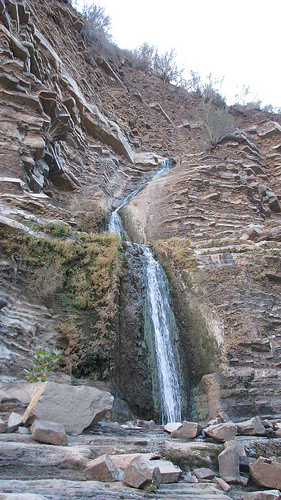 Resuming your course up Matilija Creek you’ll notice that the canyon bends sharply to the left and then back again. 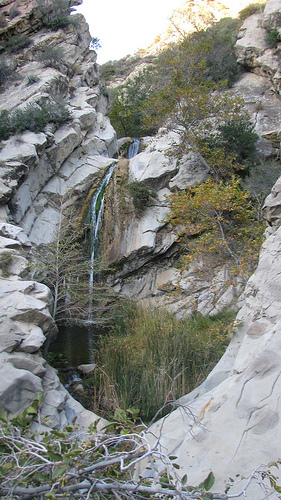 Rounding this last turn you’ll be rewarded with the first of several pools and falls that are the Matilija Falls. 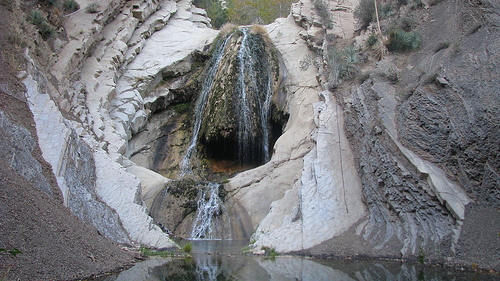 To reach the second set of pools you’ll need to climb past the first waterfall pictured below (note the rope on the right hand sandstone face.) In my haste I must’ve looked like a commando in training scrambling up the series of rock faces, snapping a few photos and then repelling back down in what seemed like record time. The pools are definitely worth the trip and best visited when it’s warm and thoughts of swimming are at the forefront of one’s ambitions.